Three weeks ago, when I went for my first outdoor run of the season, I was battling sub-zero winds while skipping over snow banks. On tonight's run, a few drops of rain sprinkled the hot pavement, adding to the flowery scent in the air that unmistakable smell of summer created by sizzling, wet tarmac. Now, everything is in full bloom, the grass is green, and clouds of pollen visibly waft through the streets as I bixi to work. 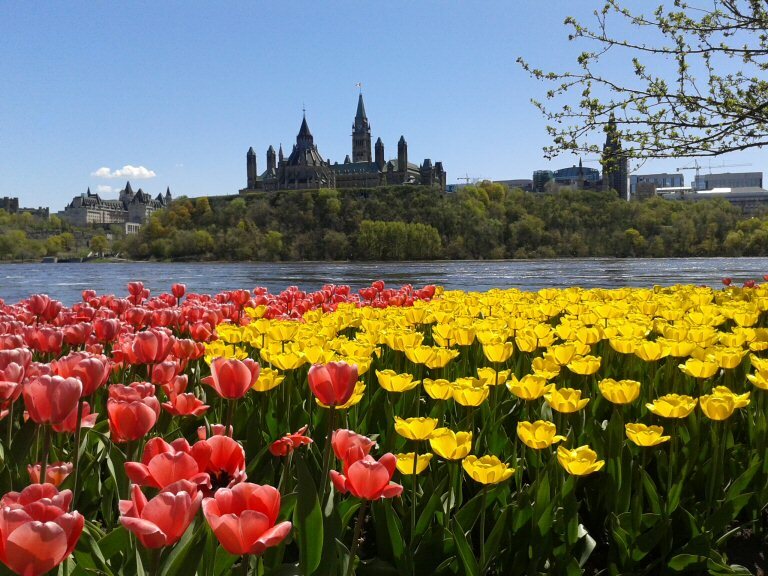 All the flowers are out, which made for a particularly beautiful trip to Canada's capital this weekend. In recognition of the refuge the Canadians had provided to the Dutch royal family during the second world war, Ottawa receives tons of tulip bulbs from the Netherlands every year, which the ever-so-diligent gardeners arrange into countless pretty flower beds all around the city. This makes for spectacular festival, and under glorious sunny skies helped us shake off the last bits of winter blues. It does not cease to amaze me just how quickly this part of the world springs forward into a summery climate. But having lived through another Canadian winter, and a rather harsh one at that, I also catch myself displaying exactly the kind of exuberant sun worship that I have mocked the Montréalais for just a few years ago. Yet here I am: Throwing on my shorts, getting on a Bixi, having a picnic in the park and dinner on the terrasse. Whether it's because we don't quite trust the warm weather just yet, or simply because we know that snow will be back before we like it, we're all soaking up the sun to the max. The mercury will continue its upwards trend, and soon the tropical heat will settle in. But this summer, I'll take it in stride - I'll install my air conditioner on Saturday.